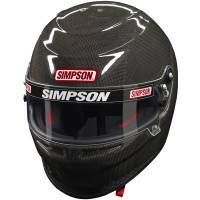 The Simpson Carbon Fiber Venator Snell SA2015 Rated Auto Racing Helmet features a plush interior and offers optional placement of Simpson's ear cup speakers. The helmet is radio ready. Simpson Snell SA 2015 helmets meet Snell?s latest and most stringent safety standards. In addition to the strict testing for high impact crashes that Snell certified helmets are subjected to, new tougher requirements have been added for Snell SA 2015 certification that also include low velocity and low lateral testing. Additionally, Simpson SA 2015 helmets must now be equipped with FIA 8858-2010 compliant M6 terminal mounts for frontal head restraints. The Simpson Carbon Venator helmet features a plush interior and offers optional placement of Simpson's ear cup speakers. The Simpson Carbon Fiber Venator helmet is radio ready. Simpson Snell SA 2015 helmets meet Snell?s latest and most stringent safety standards. In addition to the strict testing for high impact crashes that Snell certified helmets are subjected to, new tougher requirements have been added for Snell SA 2015 certification that also include low velocity and low lateral testing. Additionally, Simpson SA 2015 helmets must now be equipped with FIA 8858-2010 compliant M6 terminal mounts for frontal head restraints. The Venator Pro features an exceptionally strong outer shell and an energy absorbent liner. Pit Stop USA offers Simpson Carbon Fiber Venator Snell SA2015 Auto Racing Helmet 685000C, 685001C, 685002C, 685003C, 685004C, 685005C, 685006C at low everyday prices. Be sure to check out all our products from Simpson Performance Products including Simpson Snell SA2015 Rated Auto Racing Helmets.